Guys, I have an embarrassing confession to make. I didn't eat my first whole artichoke until two and a half years ago. Granted I'd had eaten the canned kind, you know overly soggy with way too much salt thrown into lackluster pasta. Needless to say, now that I've had the fresh kind I'm not a fan of canned. So two and a half years ago at a restaurant in Santa Monica, Nate, his friend Pete and I ordered artichokes as an appetizer. I was newly vegetarian and totally into it, except I had no idea what I was doing. Embarrassingly, I plowed right in and ate the entire outer leaf. I chewed and chewed and quickly realized something is very wrong. Thankfully, I quickly mastered the bite and pull technique for devouring yummy artichoke meat and have been making this recipe ever since. I do think, generally speaking, people get intimidated by making fresh artichokes. They are thorny, require a bit of prep work, and what's this about a choke?! But really, truly, the preparation is not that bad, and fresh artichokes are most definitely worth the effort. I should probably call this an appetizer, but Nate and I frequently down a plate of these and call it dinner. We have our routine down - he trims and cooks the artichokes while I whip up the aioli and set the table, then we head out onto our patio with two full glasses of white wine and a big bowl for the discarded leaves. Artichokes are the type of food that encourage conversation, they are meant to be savored, tasted, eaten slowly and shared. And for us artichokes and strawberries define Spring. So much so that the first time I see them sprout up on sale each spring I excitedly text Nate. Making them together almost becomes a small event we look forward to days in advance. Fill a large bowl with ice water and the juice of 1 lemon. Set aside. Prepare a large pot of water with 1 tablespoon of salt and bring to a boil. Meanwhile prepare the artichokes, working with one at a time. 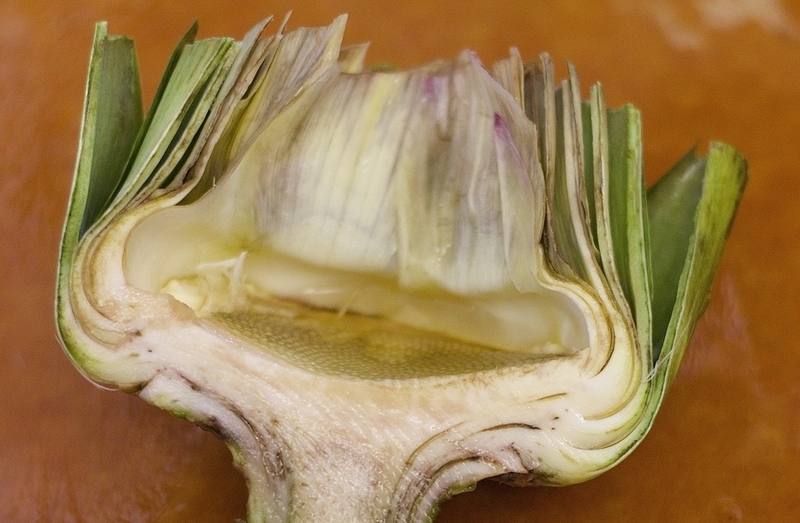 Begin by removing any leaves from the stem of the artichokes. Use a vegetable peeler to remove the tough outer layer of the stems. Using kitchen sheers, cut the sharp tips from the outer leaves and discard. Remove the tough outer layer of leaves, stopping when the leaves easily come off. Remove the tops of the artichokes then slice the artichoke in half, and remove the choke (the furry white/purple center). Place artichoke halves in the cold lemon water as they are finished to keep them from browning. Transfer the artichokes to the boiling water and cook for about 20 minutes or until tender at the center. While the artichokes are cooking prepare the marinade. In a small bowl whisk 1/4 cup of lemon juice, olive oil, 1 teaspoon of salt, and pepper. Prepare the aioli by mixing of the ingredients together in a small prep bowl until combined. When artichokes are finished transfer onto a towel to dry. Toss artichokes with parsley and marinade then serve with aioli.